One of the things I love most about all of the various things I do is meeting other writers. 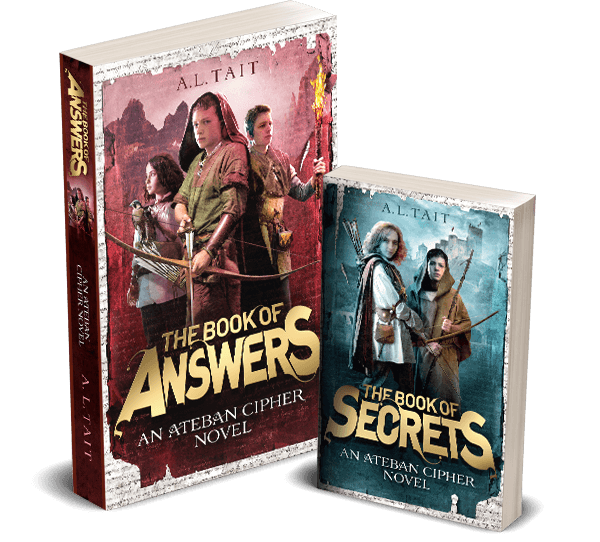 Through the podcast, the blog, social media and the Your Kid’s Next Read Facebook group, I get to come into contact with the amazing people out there who are writing all of the things. One of those people is Shane W. Smith. I first met Shane when I took my boys to ComicGong a few years ago, and he agreed to be interviewed on the podcast about how he writes graphic novels. Since then, he’s given me some great readings recommendations for the boys (who both love comics and graphic novels) and is an enthusiastic member of the YKNR FB group. 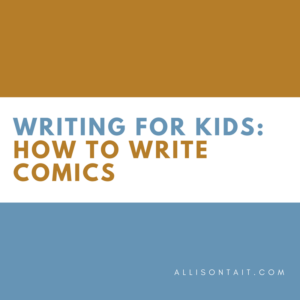 Who better, then, to write a post about how to write comics – with tips suitable for kids or beginners of any age! 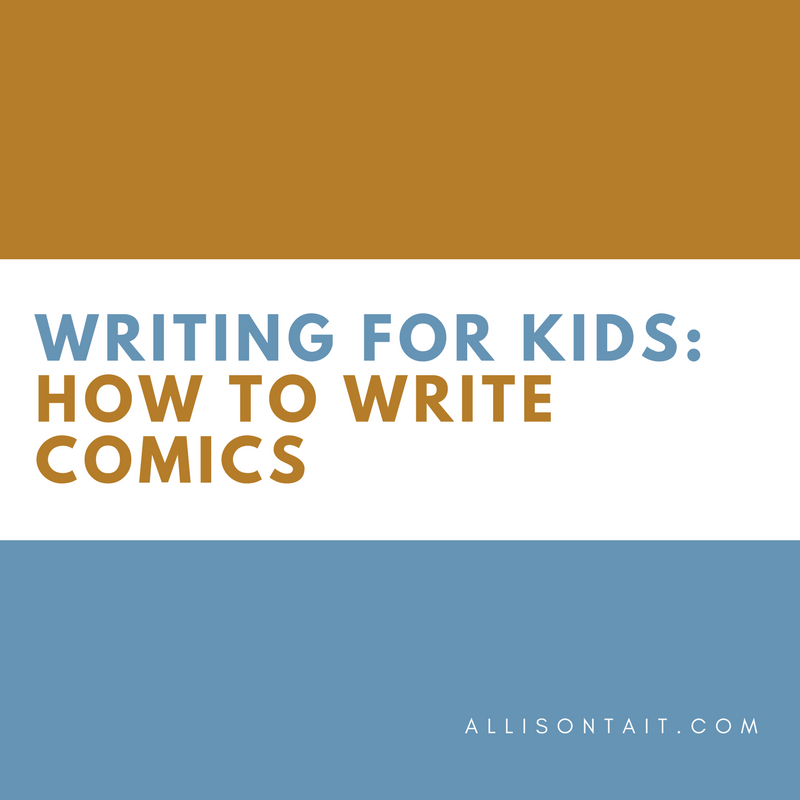 So you want to write a comic? Awesome! Working in comics is a fantastic experience, and a great way to build up your visual storytelling skills. The process for making a comic usually goes like this. A writer puts together a document called a script, which uses words to describe everything that will happen in the comic, page by page. Then an artist uses that script as a set of instructions to make the pictures. While you could fill entire books with advice about comic writing (and people have! ), here are three tips that you should always bear in mind, no matter what kind of comic you’re putting together. There’s a lot to keep in mind when you’re putting together a comic script. Thankfully one of those things doesn’t have to be a rigid script format. There are no real rules for how you have to lay out your script, or what you need to include. You don’t even have to write a script – in the olden days of Marvel comics, writers would produce a short story synopsis and leave pretty much everything else up to the artist. You might want to go the other extreme and write pages of description for each panel. Most likely, you’ll choose an approach somewhere in between these options. The only thing you really need to bear in mind is how important clarity is. The primary purpose of a comic script is to give the comic’s artist a blueprint for their role in the process. Keeping your description clear is the most important thing, and is easy to do if you focus on one simple questions: what can we see in the panel? If you’ve already teamed up with an artist, you can discuss the right level of detail for the script together. Make your own rules, but make sure you keep it clear. If you’re doing your own art, you might be able to work entirely from rough notes and dialogue. One of the most common mistakes writers make with their first comic scripts is to include multiple actions in a panel description. “Detective Walker crosses the room to his desk and sits down” is impossible to depict in a single comic panel. A character cannot be walking over to their chair and sitting down in one image. It’s only four words, and it’s only one action. What could possibly be wrong with it? It seems astounding at first glance, but it takes three consecutive panels to depict something as basic as a single blink. Eyes open, eyes closed, eyes open again. Without any one of those panels, the story told by these images changes. It helps if you think of the comic panel in much the same vein as you would a photograph. Lay out some photos in front of you, and write ‘panel’ descriptions for them – you’ll quickly get the hang of it. If you’re producing your own artwork for your comic, this is something you’ll be able to deal with and correct on your own, but if you’re writing a script for someone else to work on, it’s best to iron out these bugs up front. Thinking visually is one of the greatest challenges and amazing opportunities facing comics writers. While you can leave matters such as page layout and character positioning up to your artist, your comic will be immeasurably improved if you are able to consider these matters as well. It helps, for instance, to know that a reader’s eye will travel down the page in a lazy Z shape. If you plan to position your characters, their speech bubbles, and the direction of their actions to also travel along these lines and guide the reader’s eye, reading your comic will be a smooth and pleasurable experience. Actions and movement that break this reader flow can be jarring for readers to process, so it’s best to focus on keeping the flow going in the right direction. While this responsibility is more likely to fall upon the artist than the writer, it’s still something that you as the writer should know as well, especially if you’re writing page layouts into your script… and it’s definitely something you should know if you’re producing your own artwork. It’s a very exciting time to be working in comics, and finishing a comic is a hugely rewarding achievement. SHANE W SMITH is a graphic novelist based in Canberra, Australia. Three of his graphic novels have been shortlisted in national awards, including the fan-favourite zombie-family-drama Undad. 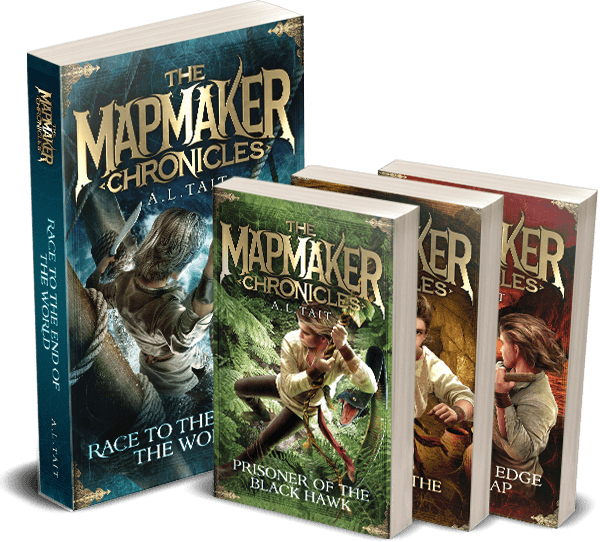 While most of his books are aimed at older readers and adults, James Flamestar and the Stargazers, a post-apocalyptic-musical-adventure-romance book which proves that art has the power to change the world, is suitable for readers aged ten and up. Grown-ups can obtain a free copy of James Flamestar and the Stargazers for the whole family by signing up to Shane’s mailing list.